The private affair that was our wedding has lent itself to an equally private anniversary. Nobody was at the wedding, therefore nobody remembers the anniversary — but me. Like any other key date, the days leading up to the actual day are often harder than the day itself. Perhaps it is the anticipation. After the fall of 2009, I tend to expect the worse and hope for the best. I caught myself planning for a bad day. I considered calling in sick and huddling under the covers for the majority of the day. It’s funny that I would think that I would need that. Those days are long gone — thank God. 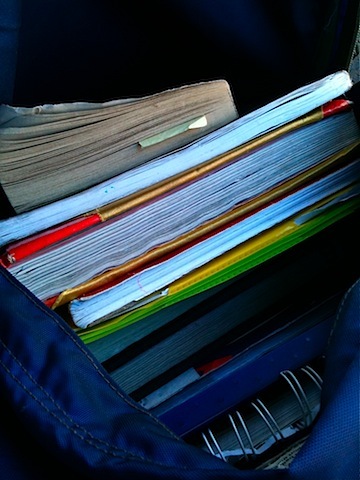 This is what YaYa’s backpack looks like about midway through loading. It’s crazy heavy — especially since he is only in 6th grade. When it’s fully loaded, I struggle to pick it up and wonder if he really needs this heavy of load at such a young age. In other words, shouldn’t our kids be fully grown before such weight is put on their shoulders. I mean this both physically and figuratively. YaYa, who did spend the 1st two weeks of school vacationing in France, has struggled BIG TIME this year. His vacation didn’t help, but the demands of football hit harder. Never have he and I both kept such a close eye on his grades. He gets two grades to come up but one creeps down slightly. As the grading period nears the end, the pressure builds. YaYa badly wants to play on the basketball team. It’s a great motivator but, had I stuck to my original plan to not sign the forms if his grades were not all at a certain level, he’d be out already. I caved and let him continue to work on them as the roster gets formed. Ultimately, I knew that the school would put on the breaks if he doesn’t come through. I really hope that his grades will come up to par. I want to see mostly A’s and B’s with only a few C’s and nothing lower. He’s certainly trying.